The Medical Center Archives Spring/Summer 2016 newsletter is now available. To read it, visit: /newsletters or click on the image below. In 1974, Duke Professor of Pediatrics, Jay M. Arena, traveled to the People’s Republic of China as part of the American Medical Association (AMA) delegation. As a pediatrician, Arena’s interest lay in the health and nutritional status of children in China. The Medical Center Archives is happy to announce that we have added more historic photographs to MEDSpace. Over 30 images from the 1930’s to the 1990’s have been uploaded to the digital repository. Included are portraits of Chairs and Division Chiefs, photos of nursing students, images and artwork of campus buildings, and candids of hospital staff at work. The new additions can be viewed by scrolling down to the bottom of MEDSpace’s homepage and clicking the “Recent Additions” tab on the far right. 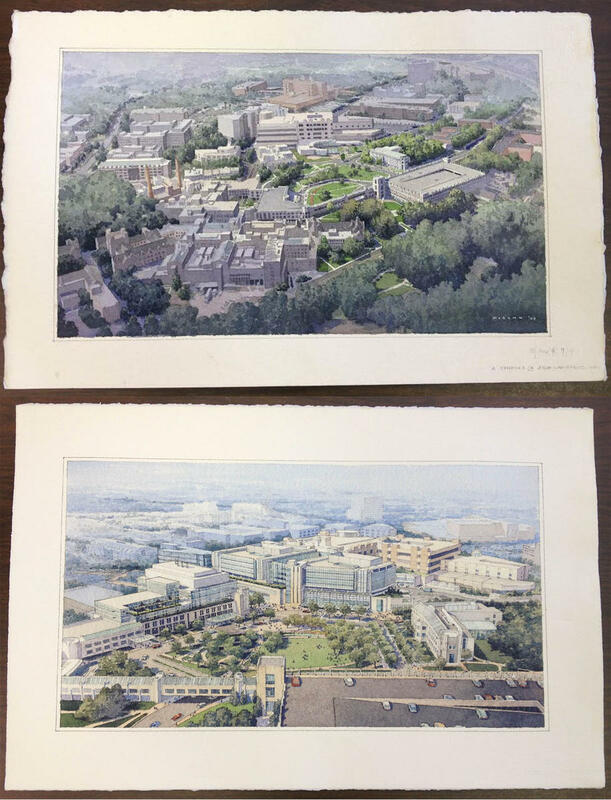 Just in time for spring’s colorful blossoms, the Duke Medical Center Archives acquired three vibrant watercolors of Duke Medicine buildings from the Facilities, Planning, Design/Construction department. The paintings were added to the Facilities Planning and Development Collection. The watercolors depict the Medical Center (2003), the Duke Cancer Center (2009), and Duke Medicine Circle (2009). The Medical Center and Duke Medicine Circle include campus views, while the Duke Cancer Center painting shows the front of the building with flowers in full bloom. Click to enlarge the image. The Duke Medical Center Archives is happy to be a co-sponsor of the upcoming Wikipedia event. Full details are below. If you think the Medical Center is easy to get lost in now, consider what it may have been like decades ago, before standardized signage was created. 45 years ago this month, March 1971, Duke University Medical Center introduced its first major signage system, SEDO. During the 1960s, the Medical Center experienced unprecedented growth. New development meant more buildings, more employees, and more patients. As it expanded, the need for a way to easily navigate the growing complex became increasingly important. To address this issue, Duke hired a graphic designer to produce and oversee the implementation of a new wayfinding system. In honor of Black History Month, in this blog post we’re featuring Prentiss Harrison, who, upon graduating from Duke’s program in 1968, was the first African American PA in the nation. Harrison first heard of Duke’s fledging PA program while working as an operating room technician at the UNC Chapel Hill Hospital. Established in 1965, Duke’s program was a two-year course intended to train students to practice medicine and provide health care services under a doctor’s supervision, and was the first of its kind in the nation. Harrison, who had been trained as a medical corspman while serving in the Army, recognized that this new field could offer professional opportunity and advancement. He applied and was accepted into the second class. 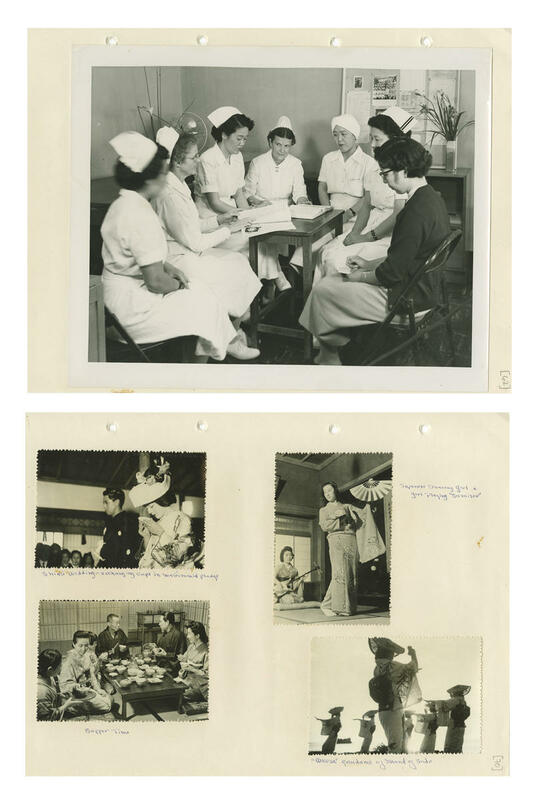 We have several scrapbooks of programs and individuals associated with the Medical Center in our collections at the Archives, but a particular favorite and one we want to highlight in this post is those of Mildred Sherwood. We are happy to announce that the Department of Arts & Health at Duke Records are processed and open for research. This interesting collection documents the department’s history of providing cultural services programming for Duke Hospital. Fittingly, the collection displays material in a variety of formats, from published poetry compilations to scrapbooks highlighting sponsored performing arts programs, as exhibited in the image on the right. We are happy to announce that a new collection, the William H. Briner Papers, is now available and open for research.